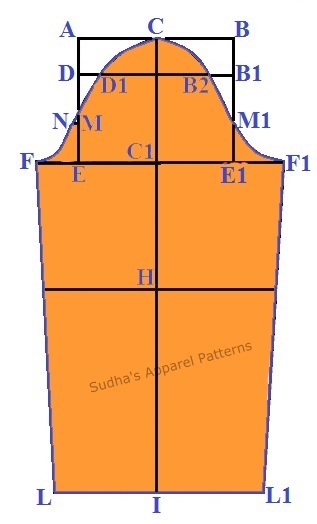 Sudha's Apparel Patterns: How to make Women's wear Basic Sleeve? How to make Women's wear Basic Sleeve? Before you make the Basic sleeve draft, measure the armhole circumference from women's wear Basic bodice accurately with a measure tape. In order to ensure perfect fit of sleeve and at the same time to ease movements, add 3-5 cms to the measured armhole circumference. Begin with top left corner of the square. This is point A.
D-D1 = Move right 3 cms and use a curve to draw the sleeve cap. I-L1 = Square right from point I the same measurement as line C1-F – 2.5 cms. Some Tip: *Sleeve ease may change according to fabrics and sleeve style line as it happens to the wrist width. Once your Basic Sleeve is made on paper, do check its fitting by stitching & attaching the sleeve to Basic bodice before you proceed to use this draft as a base for all your future garment patterns. Just place & cut the sleeve pattern on a basic cotton muslin fabric by keeping seam allowance of 1 cm. on all sides.